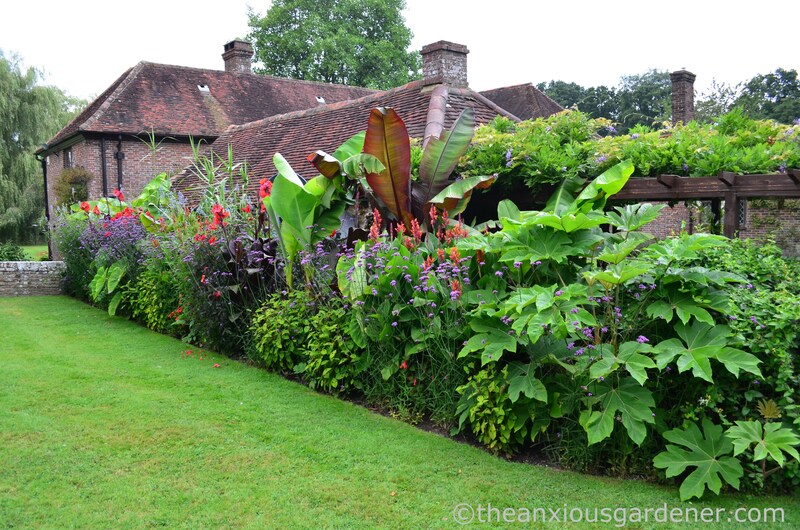 Each year, I hope that the Tropical Border will improve on the one before; that it will produce more flower, more stature, more oomph. And mostly that’s what it has done over the past five years … except perhaps this year. Overall, 2016 hasn’t been its best. It still looked pretty good though and the unfurling of vast leaves and splashes of loud, vibrant colour gave me a great deal of pleasure. 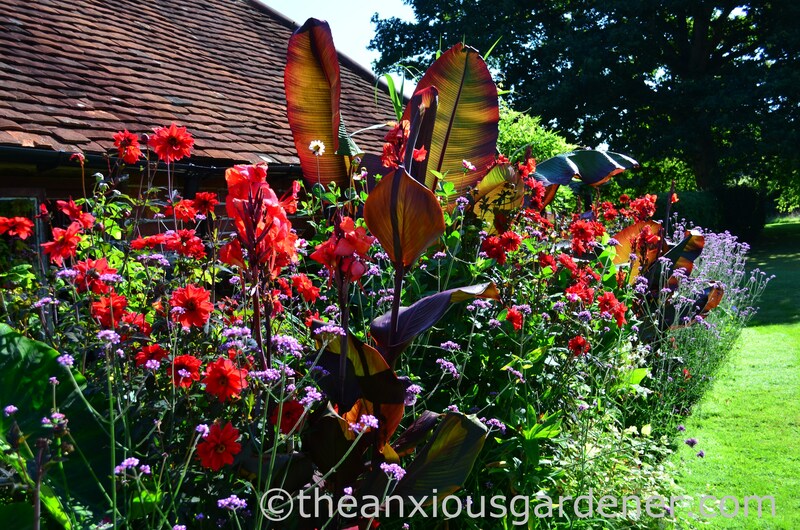 But if a few plants under-performed or failed to live up to my lofty expectation well, we all fail to deliver sometimes. 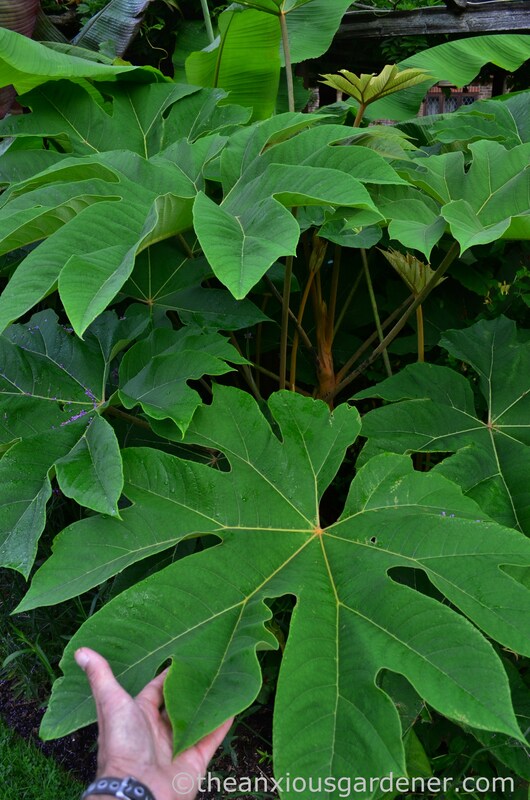 when Tetrapanax papyrifer ‘Rex’ showed the first glimmers of life. 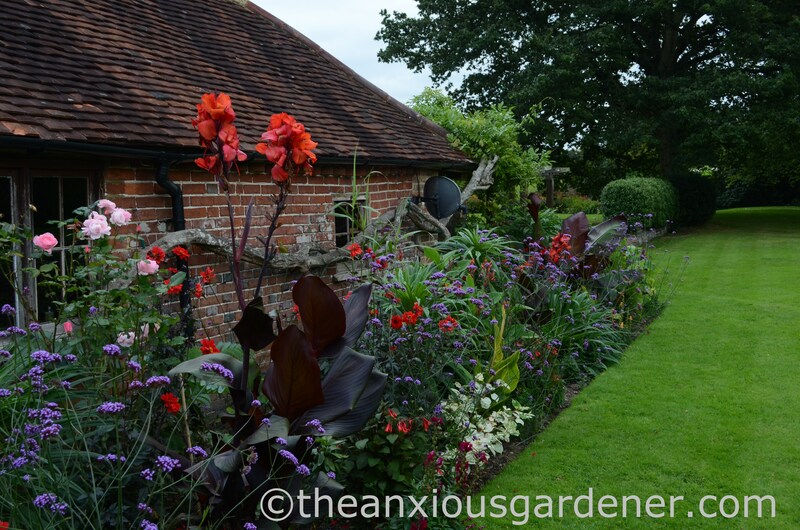 Last year, I installed soaker hose in the border and connected it to an automatic watering system, which has saved me endless hours staring at a jet of water. I left the hose in the ground overwinter and it survived without mishap … right up until the moment I stabbed it with a digging fork. Twice. (Cutting out the punctured length, inserting a short, rigid pipe into the cut ends and securing with couple of jubilee clips fixed that problem). 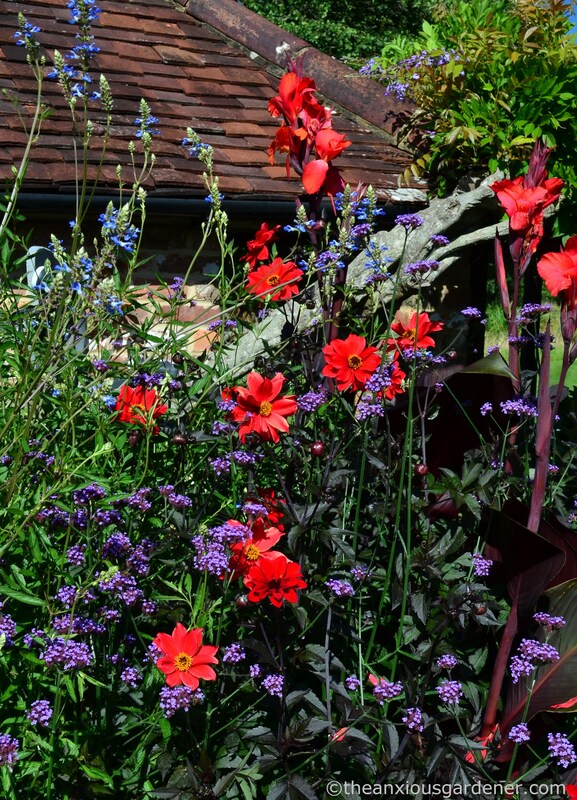 and, either singly or in pairs to form circles, pushed them in around the bendier of plants: the dahlias, the cannas and Salvia uliginosa. 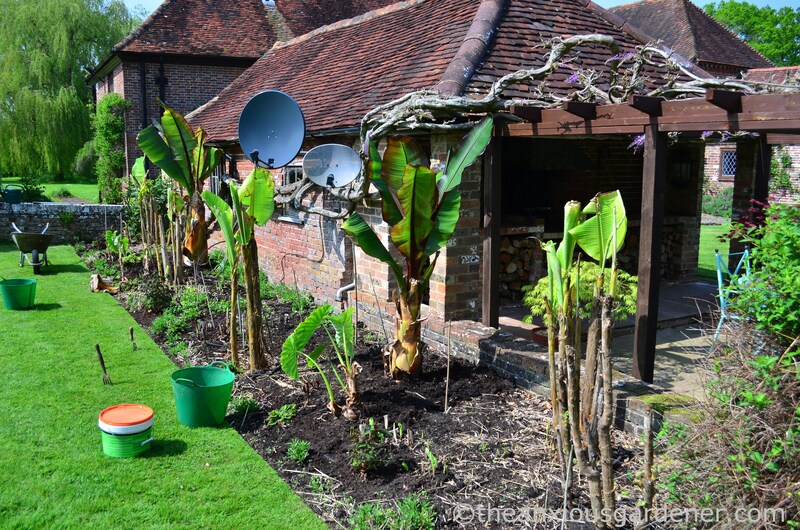 By early July, the bed filled out shrinking the expanse of brown earth but one of the large red Abyssinian bananas (Ensete maurelii) – visible left, off centre – didn’t grow at all: from planting out until I dug it up again in November. 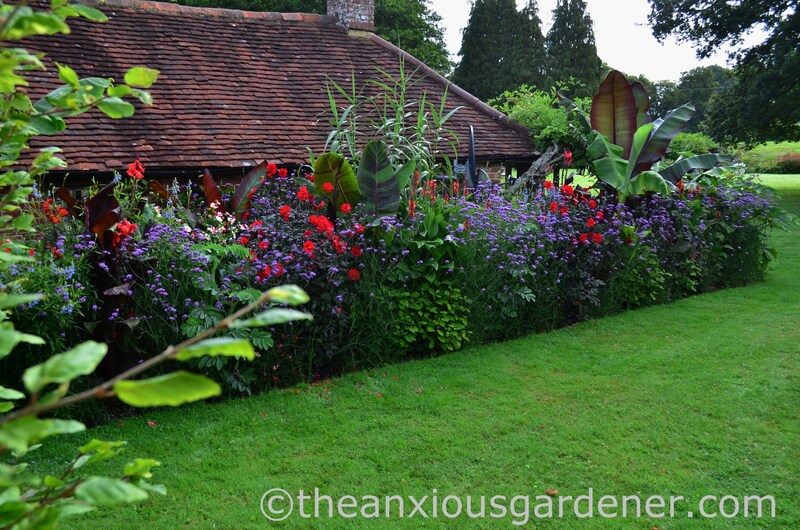 A month later, when the border matured, it was completely lost from view and remained so for the rest of the season. Which was annoying. The Ensete is still alive it just … erm … didn’t grow. I have no idea why as, having now dug it up again, the root system is healthy. Oddly, a similar thing happened in 2015 but to the other of my two plants. Perhaps, they’ve decided to take alternate rest years. 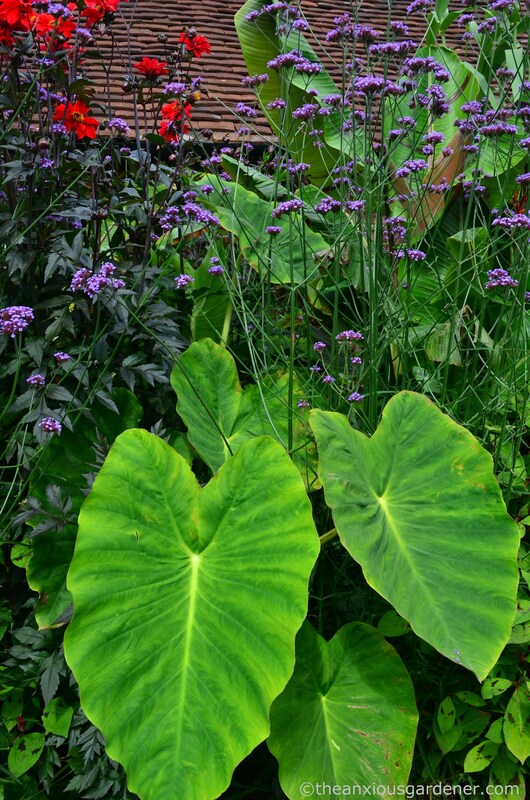 Colocasia esculenta, on the other hand, did pretty well. 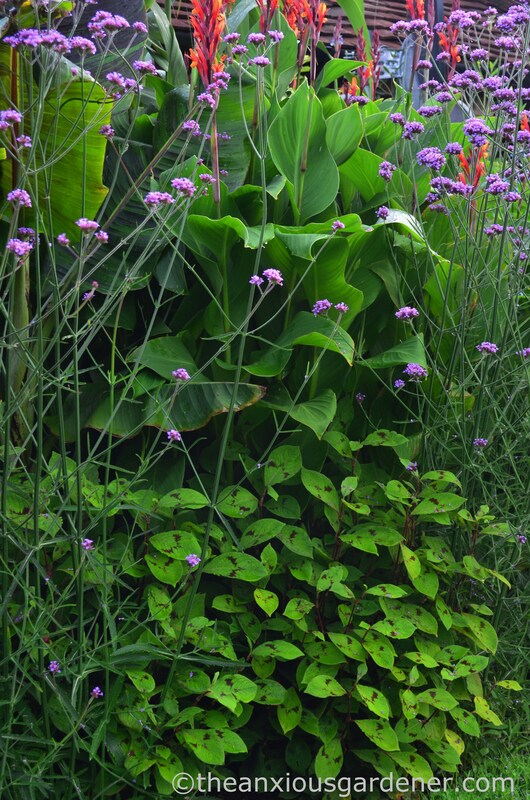 I planted them further forward than in the past and their big, quivering leaves poked out from the undergrowth like an inquisitive herd of small elephants. Or something. 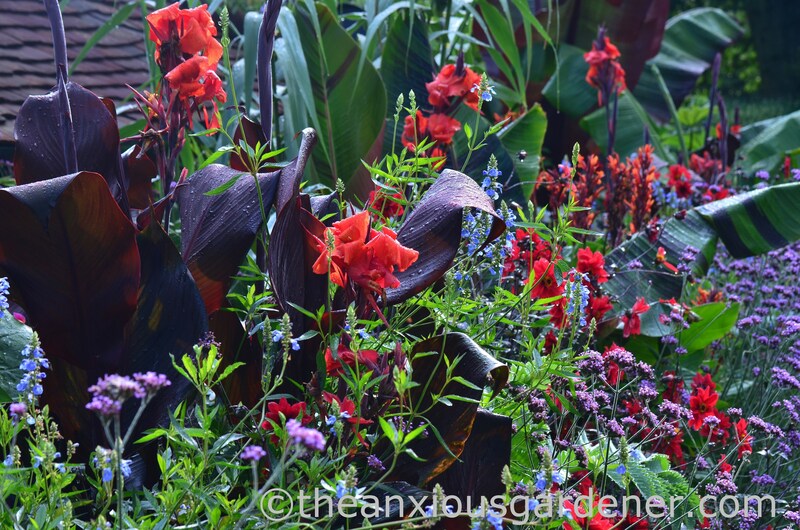 Canna ‘Red King Herbert’ also did well with my steel supports preventing their usual habit of kneeling over to kiss the grass. 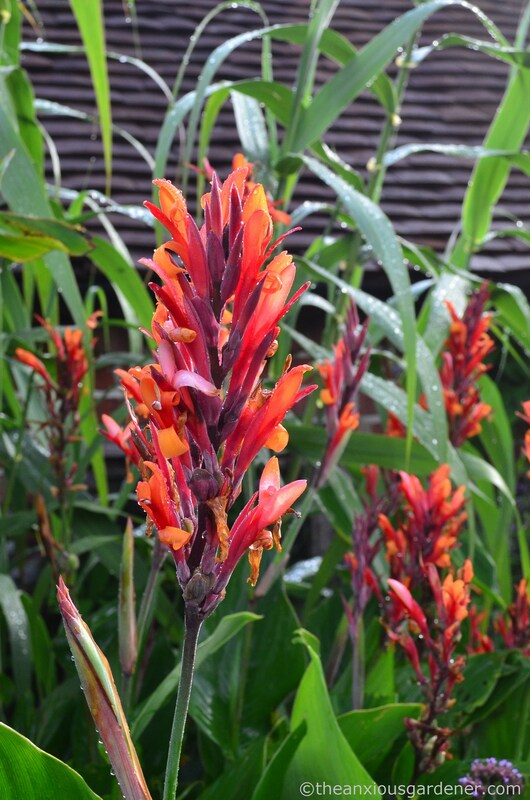 As I’ve written before, Canna coccinea doesn’t need staking and arguably had more flower this year. 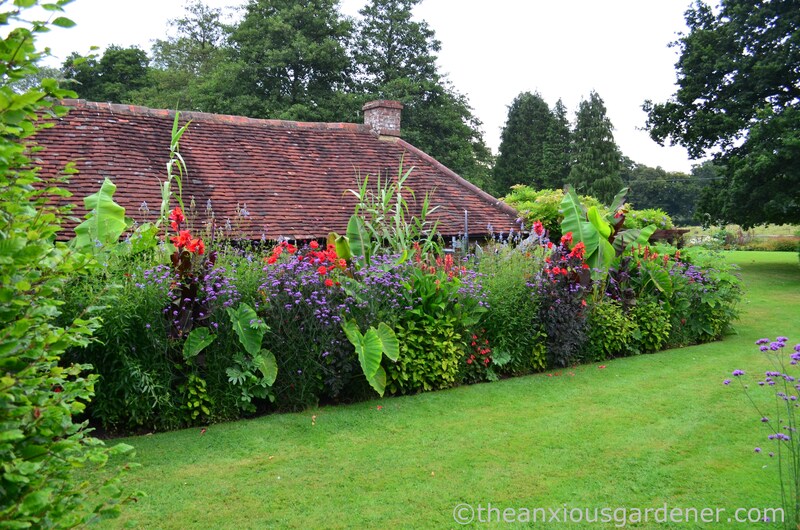 I’ve split my original clump to provide two big plants and would split it again if I could squeeze in a third. 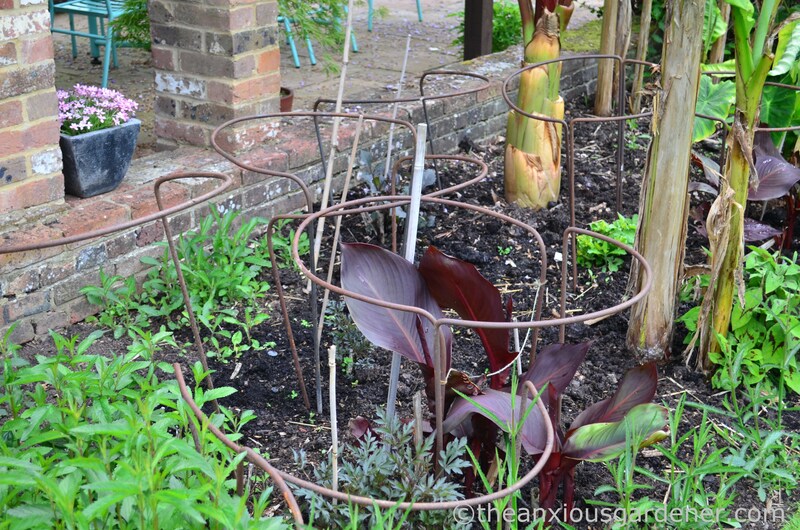 aided by hefty amounts of pelleted chicken manure and regular watering. It stays in the ground over-winter under a compost mulch. 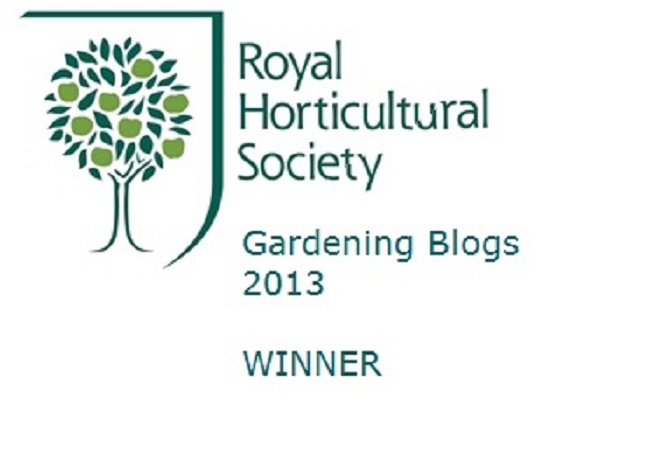 Dahlias on the other hand were a mixed bag. 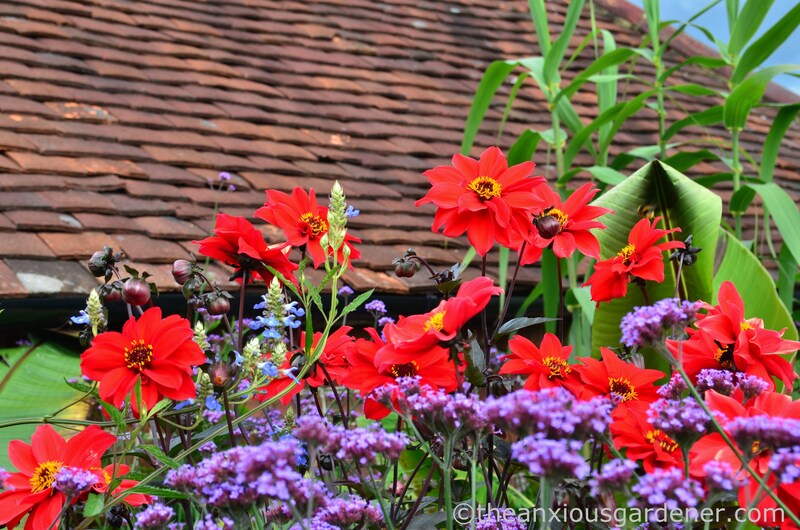 A couple of years ago I wrote “Dahlia ‘Twyning’s Smartie’ produces a staggering amount of flower – each one different. 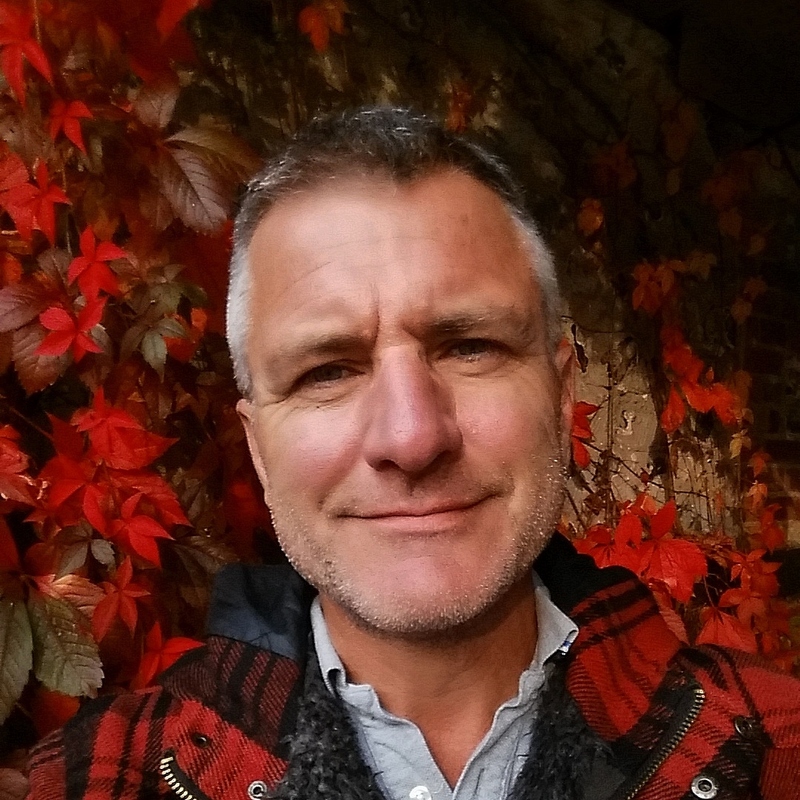 It is a reliable, non-stop stalwart, thuggishly shouldering to the fore.” But that was then and this year my confident assertion proved patently untrue: Smartie failed to produce any decent growth and isn’t visible in any of these photos. I leave my dahlia tubers in the soil to overwinter too, again under a mulch, but I shall dig up the three or four Smarties to see what’s up. 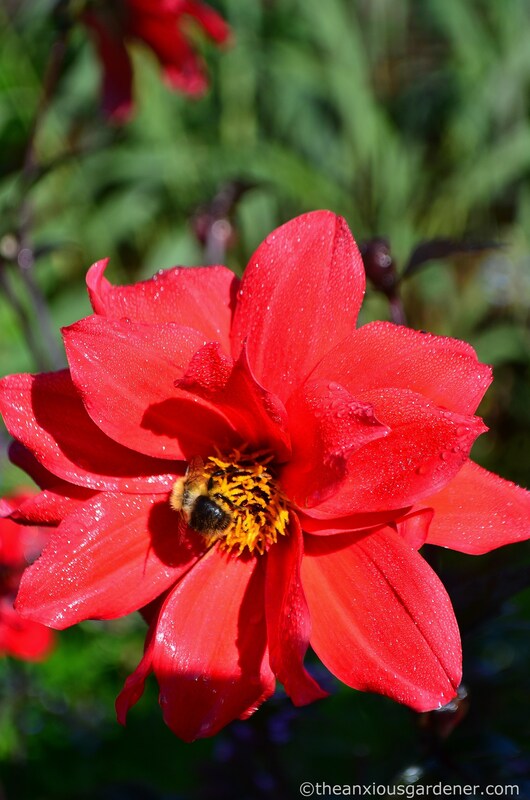 Fortunately another mainstay of the bed flowered as well as ever – Dahlia ‘Bishop of Llandaff’. along with my third dahlia, D. ‘Twyning’s After Eight’. (but I did miss my Smartie). 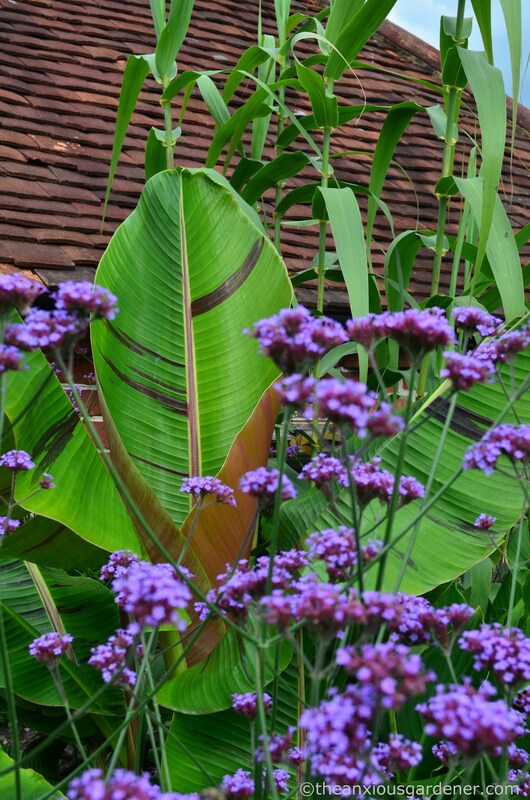 A new addition to the border last year was the hardy banana, Musa sikkimensis which continues to thrive (and reinforces my growing disregard for the more mundane, unmarked leaves of Musa Basjoo). 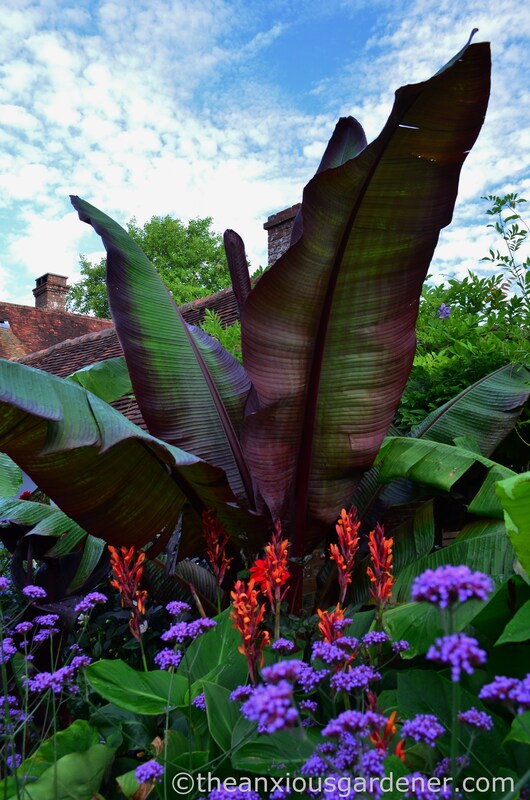 One of my two Abyssinian bananas did produce huge red leaves – central in the above photo – but a 50% strike rate is pretty rubbish and the failure of the other left an irritating hole in my grand scheme. (Which actually shouldn’t be so very irritating given I’ve had the same problem two years running). 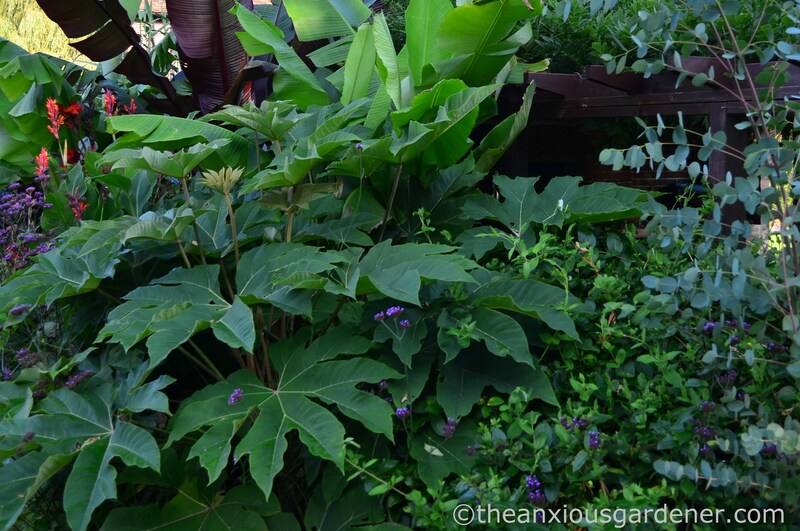 From those few tiny leaves in May (shown in the third photo from top), Tetrapanax papyrifer ‘Rex’ didn’t disappoint. I hadn’t realised how invasive its roots are however and little clusters of leaves shoot up metres away from the parent – and are quickly pulled up. How many more TPR’s can I give away? 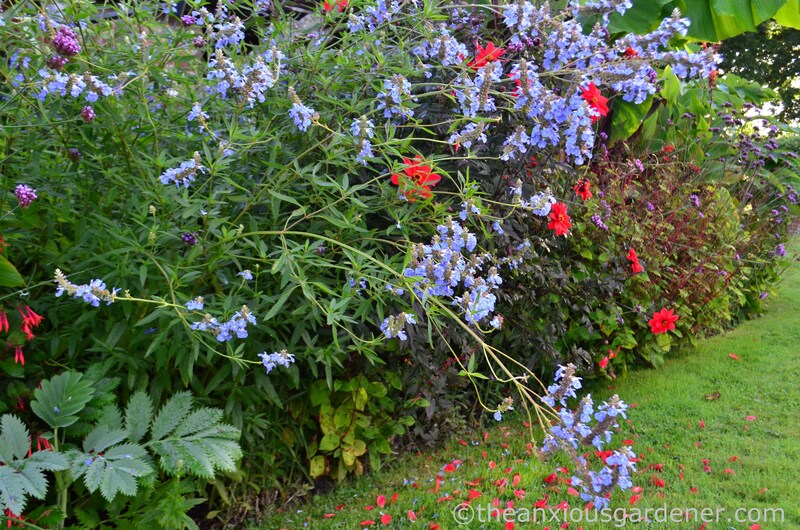 Despite plant supports, Salvia uliginosa still keeled over. It grows to over six-foot and a metal ring about its knees didn’t much prevent the top two-thirds flopping about all over the place. And that’s a shame for a plant I love so much; a plant with an enormous amount of flower right through to the first frost. 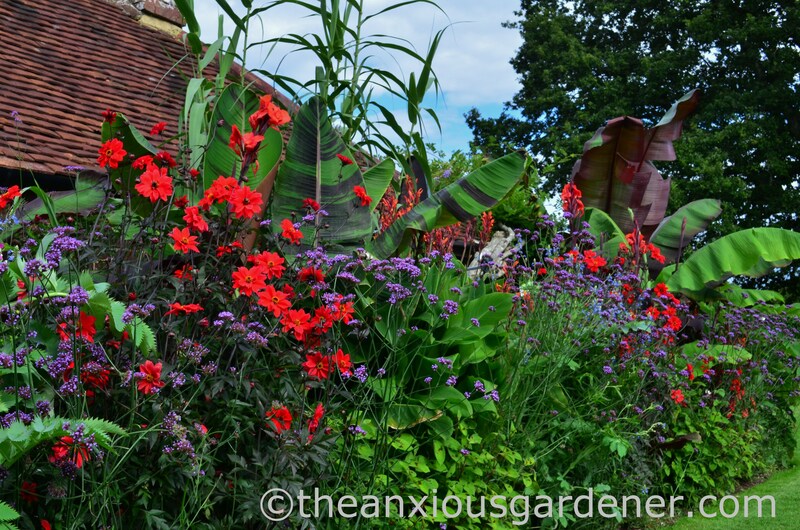 But I shall remove it completely from the tropical border next year. With plenty of feed and daily watering it grows too vigorously, flops and madly colonises by runner to swamp the neighbours as well. A sad farewell to an otherwise excellent plant (but I’ll use it elsewhere). 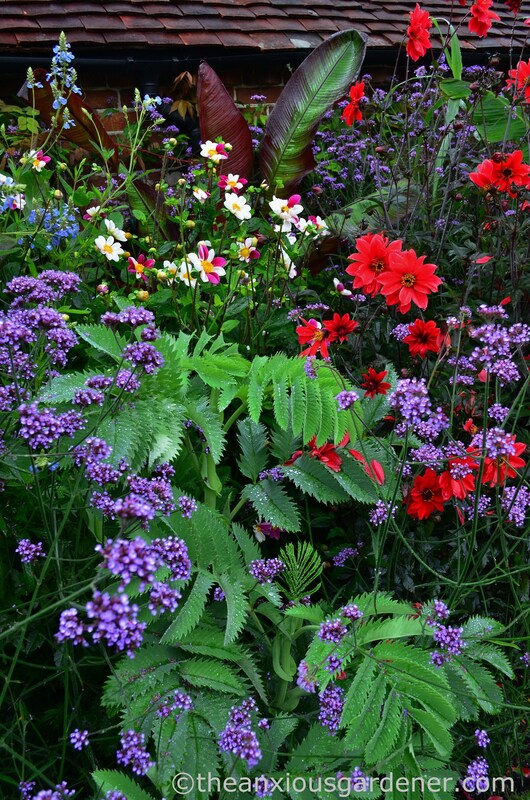 I’m also going to remove all the Verbena bonariensis. 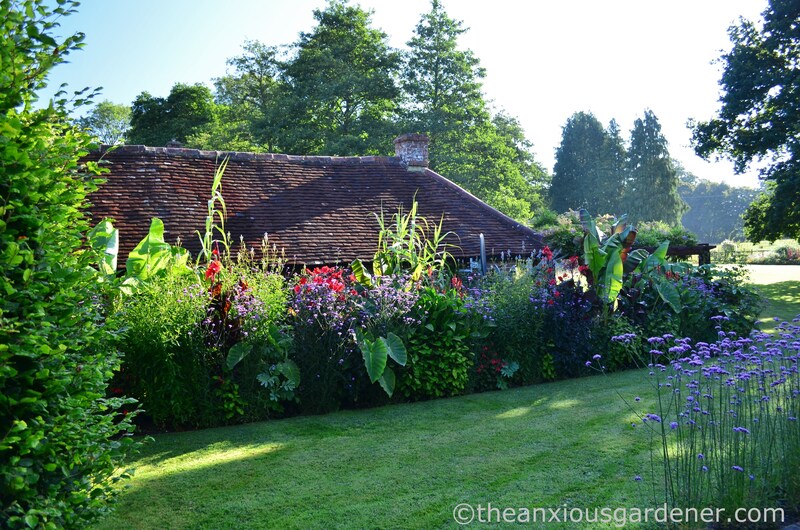 I originally added this as filler when the bed was still gappy but it’s hardy necessary any more (though I said that a year ago so don’t be cross if you spot it again in 2017). 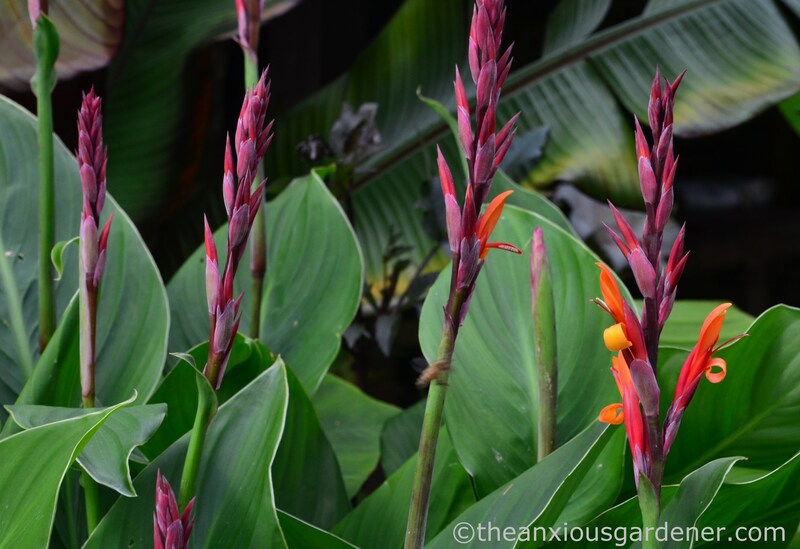 Next year, thanks to the kindness of Big Plant Nursery, I’ll need to find space for Cautleya spicata ‘Robusta’, a hardy ginger, and Aechmea recurvata var. recurvata, a “super rare bromeliad”. Fancy. BPN very kindly sent me these two gifts along with an invite to visit their nursery in West Sussex, which I certainly intend to take up. 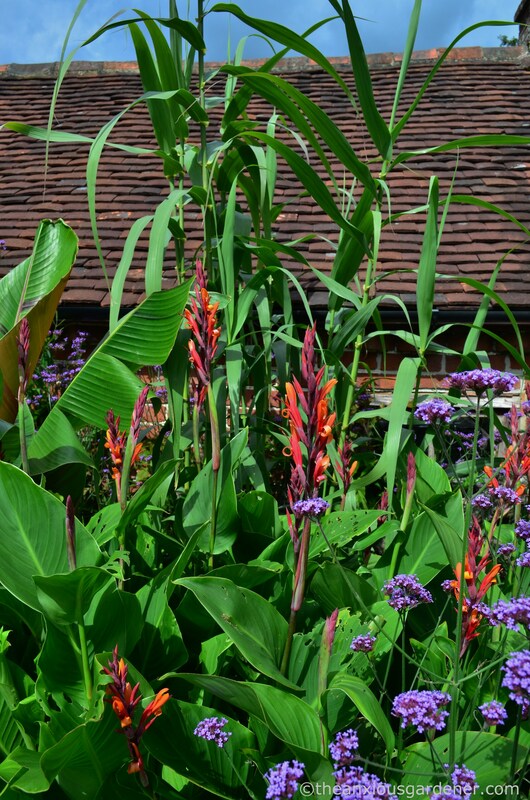 I’ve written at length over the years about my tropical border with plenty of detail on all the plants I use and various ones I’ve tried and discarded (see, amongst others, The Tropical Border – 4th Year). 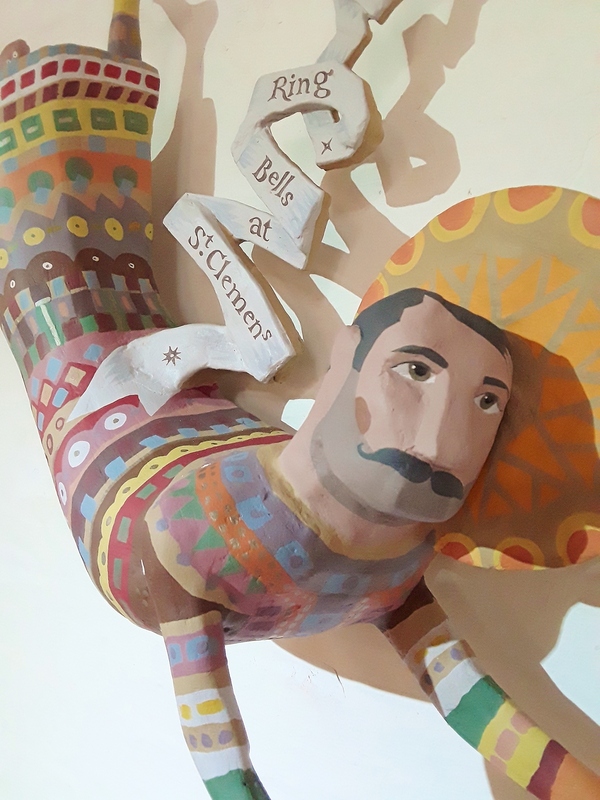 This 2016 post, originally scheduled for September, is late because of our continuing house renovation but I wanted to continue my now annual tradition of showing the border’s evolution, even without that detail I’ve provided in the past. If nothing else it gives me a useful record of the bed from one year to the next. Normally The Priory has its first frost in October, sometimes even in September. 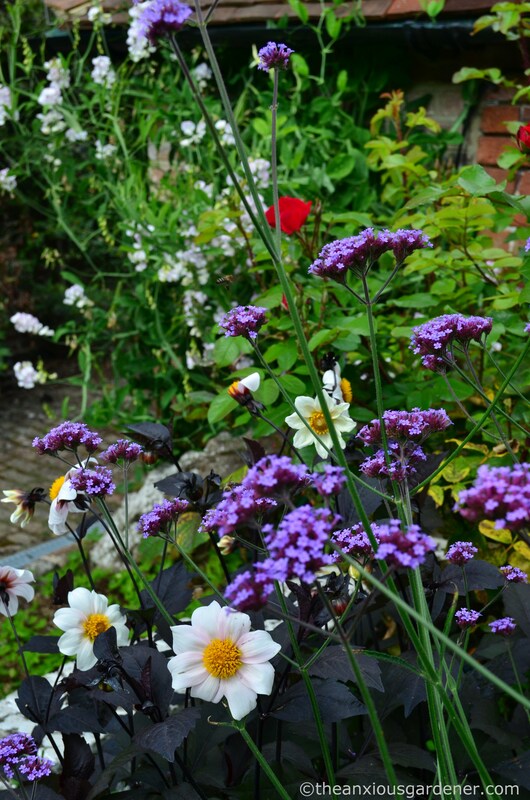 This year, the border didn’t meet its mushy end until 1st November – giving me the longest display to date. 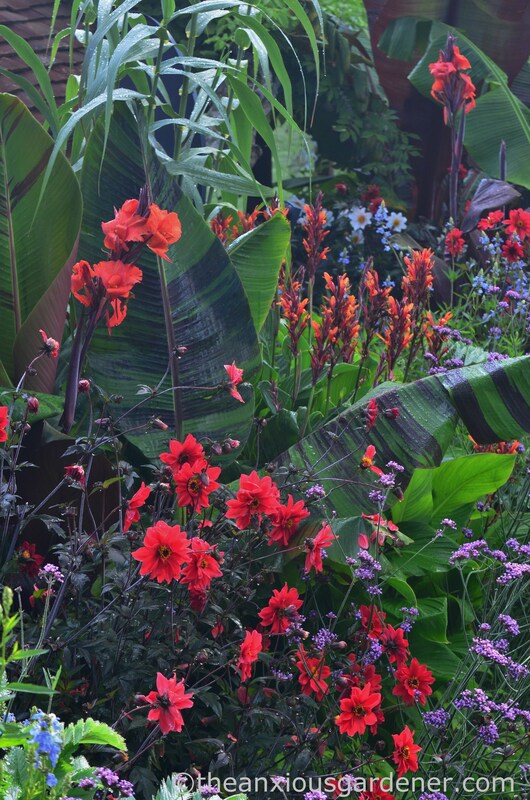 The tropical border might be a lot of work, a lot of angst and sometimes a little disappointment but in return it provides a big box of delights. I can’t wait for 2017.
but a year later it looked more the part. 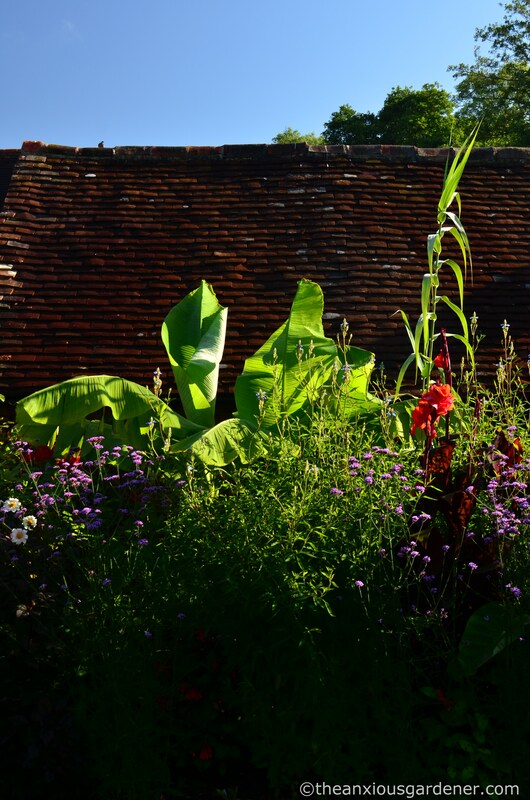 And by 2014 many of the plants were enormous and the bed did have a whiff of tropicality about it. This year it has continued to mature and, on the whole, I’m pleased. I’d hoped for more height in places (if only to hide the satellite dishes) and less shirking from some of the team. The weather didn’t help. 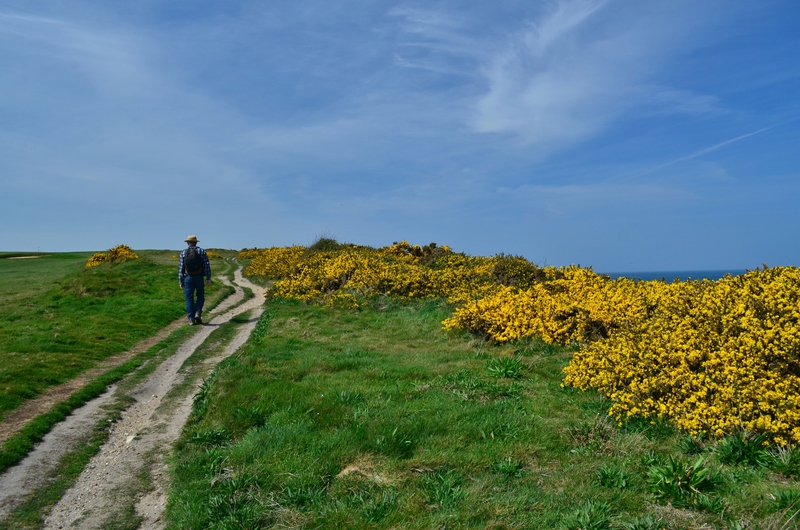 The 2015 Sussex spring was cold and stormy; summer got off to a goodish start but then turned wet, blustery and cool. 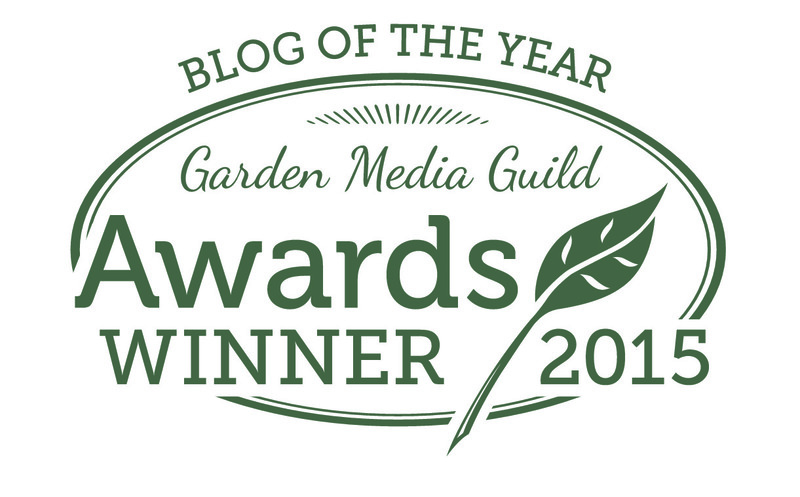 I’ve recently added an automatic watering system (see ‘The Tropical Border and How I Learnt to Hate Soaker Hose’) but this was the year I needed it least. 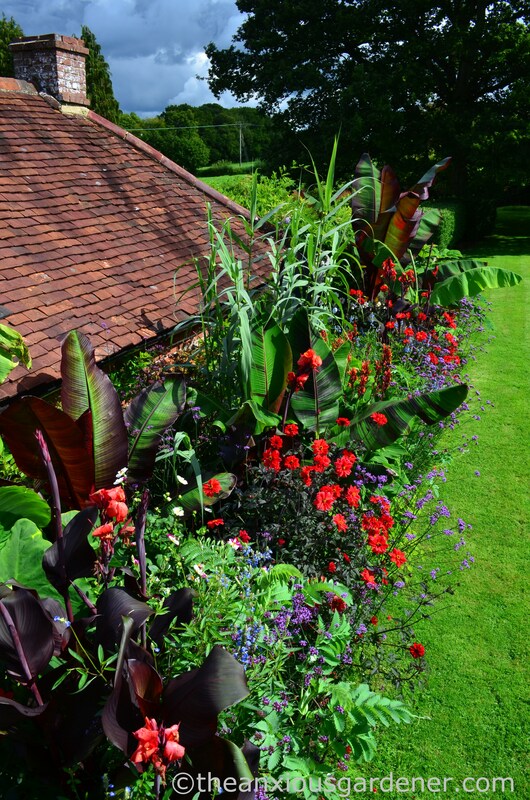 Certain plants have flourished however. 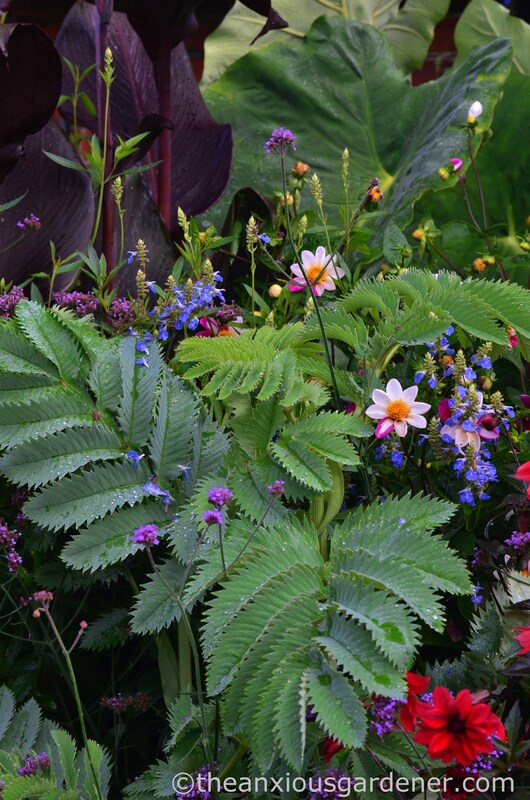 For example, I moved two Melianthus major from lost-at-the-back to front-of-stage. 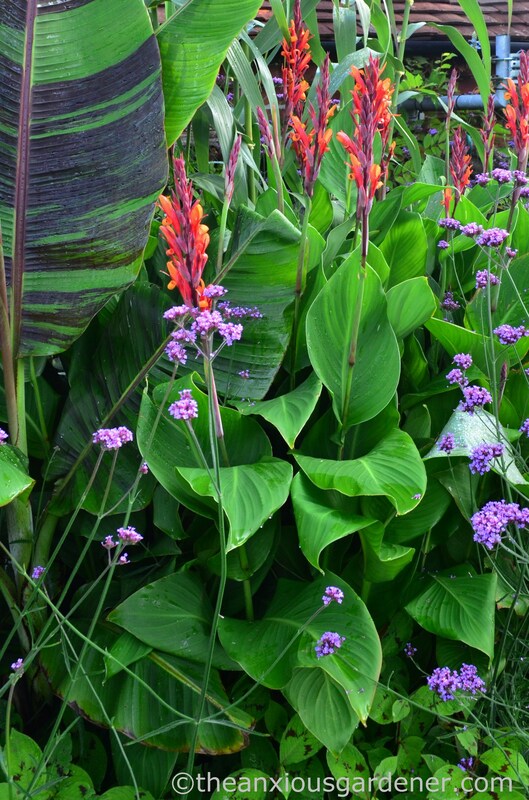 These handsome, elegant plants have responded to the increased light and grown tall. They will die back in winter but the roots are relatively hardy. And best of all? The leaves smell of peanut butter. One of my red Abyssinian bananas has been less successful. 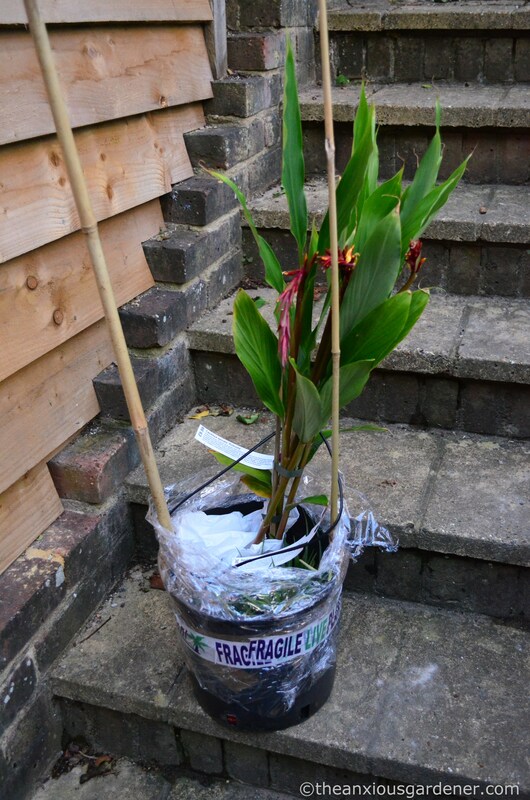 I planted out two Ensete maurelii too early this year. The ‘small’ one shrugged off its cold, rude awakening and now towers far above my head. Whereas the ‘big’ one withered and, confusingly, is now the ‘small’ ensete. It sits pathetic and hardly visible, skulking at the back. And that’s a shame – its huge, sail-like leaves would have filled the central space nicely (it peeks up in the middle of the above photo). 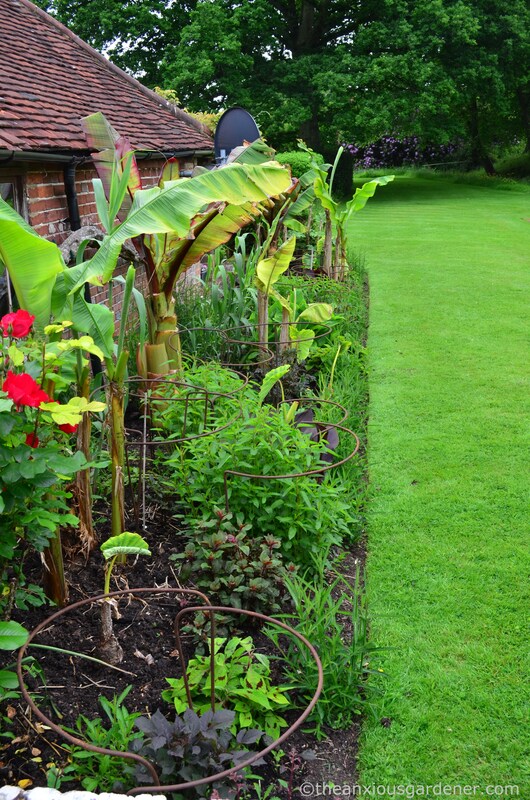 But I am tiring of the hardy banana, Musa basjoo (above left). 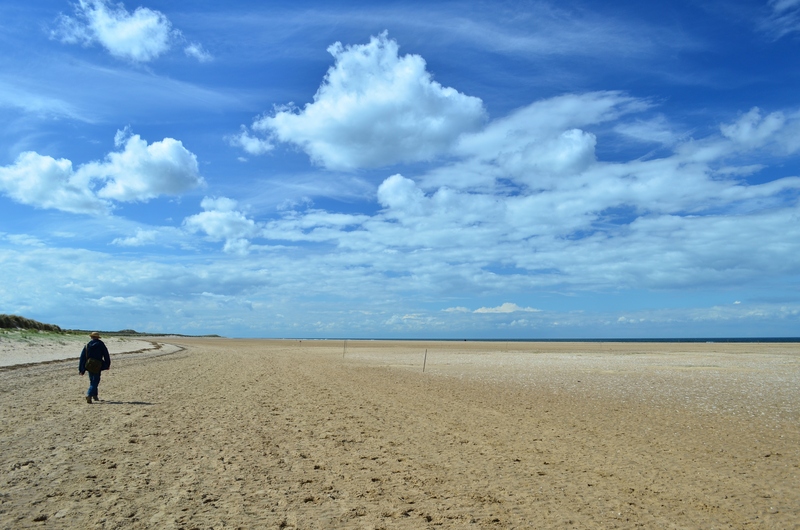 The slightest breeze shreds the leaves, which also discolour and are prone to brown spots. 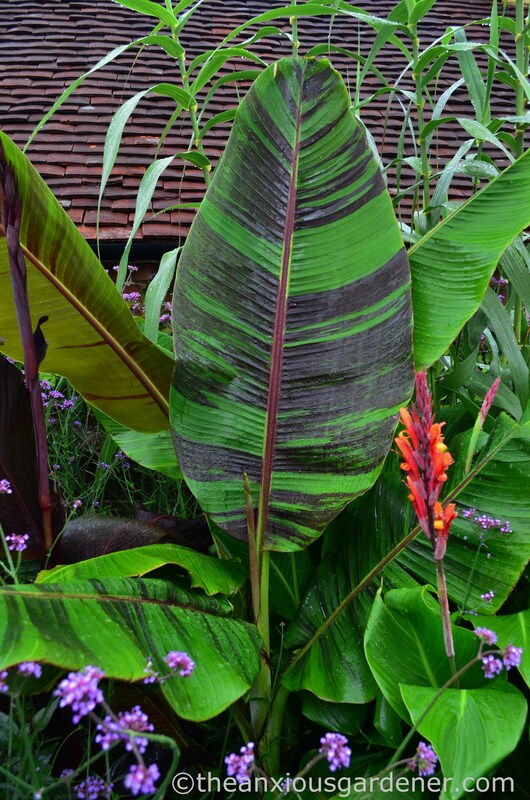 On the other hand, I’m impressed with this new addition – Musa sikkimensis. 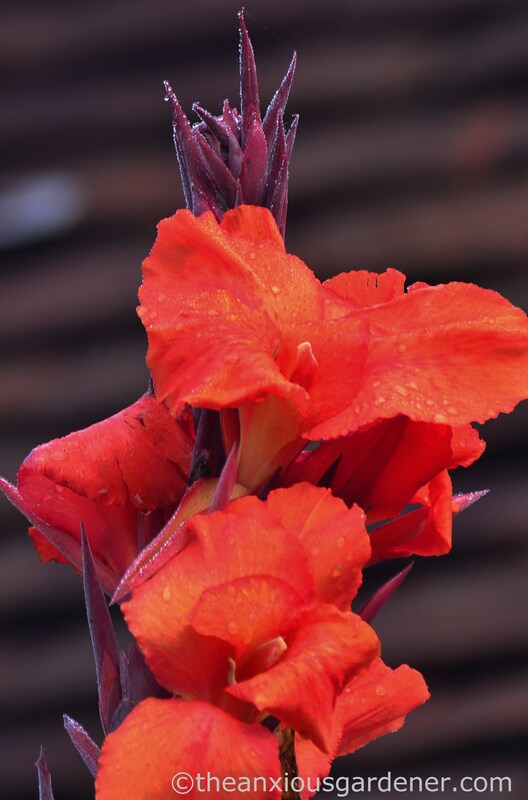 Reputedly only second in hardiness to the basjoo, the leaves don’t tear as easily and they have attractive dark red bands. 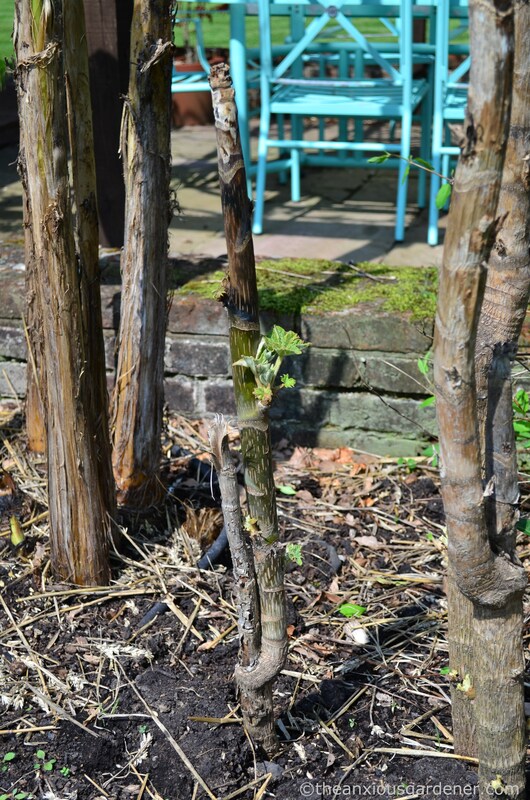 It is growing fast and has produced several stems: stems which I’ll shear off and use to gradually replace the basjoo. 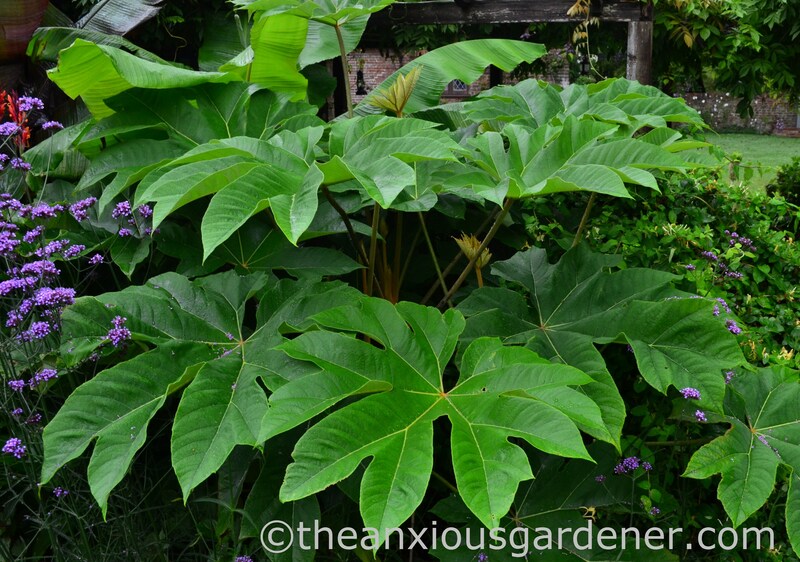 Tetrapanax papyrifer ‘Rex’ is another large foliage plant which gets bigger and better each year. Initially, I made a schoolboy error and cut it down to ground level in autumn. I’ve since learnt to leave the naked, winter stems alone: they survive low temperatures and new growth now starts with a foot or two head-start. 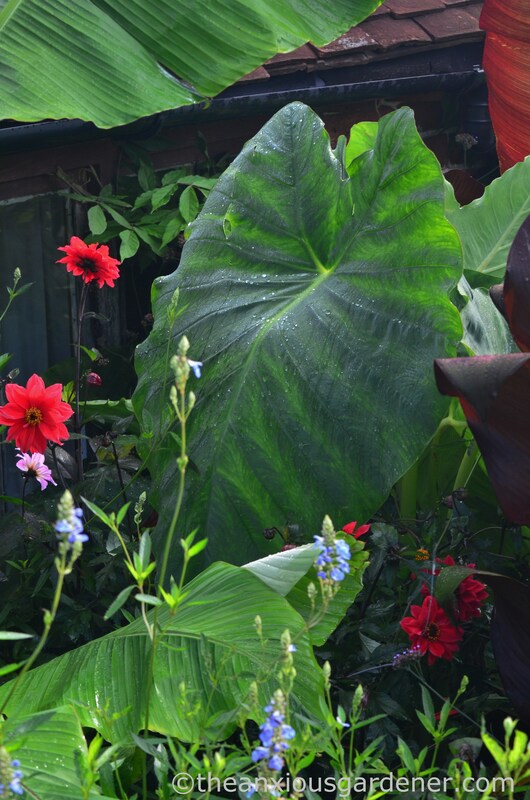 I’m a sucker for Colocasia esculenta – also known aptly as elephant ear. 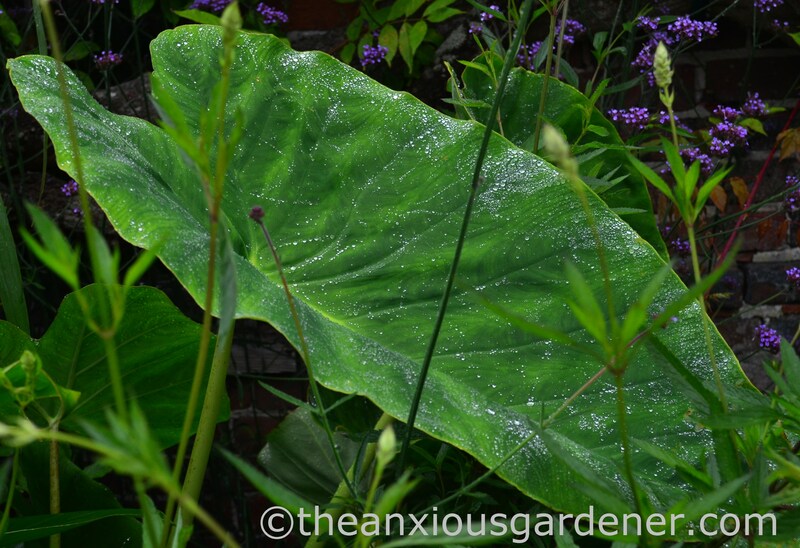 It is one of my favourite plants; wagging gently in the wind or holding a perfect tracery of dew. 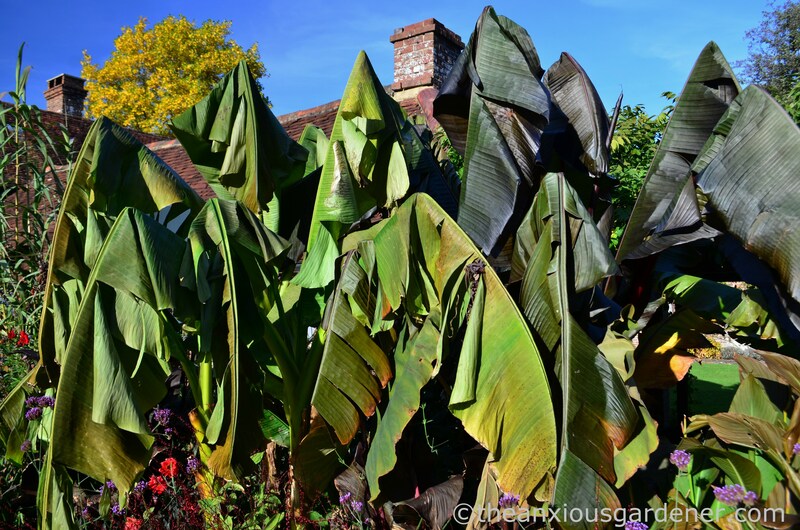 There are three in the bed (including a young, even larger form – Colocasia gigantea) and eventually they will all unfurl well above the under-storey? 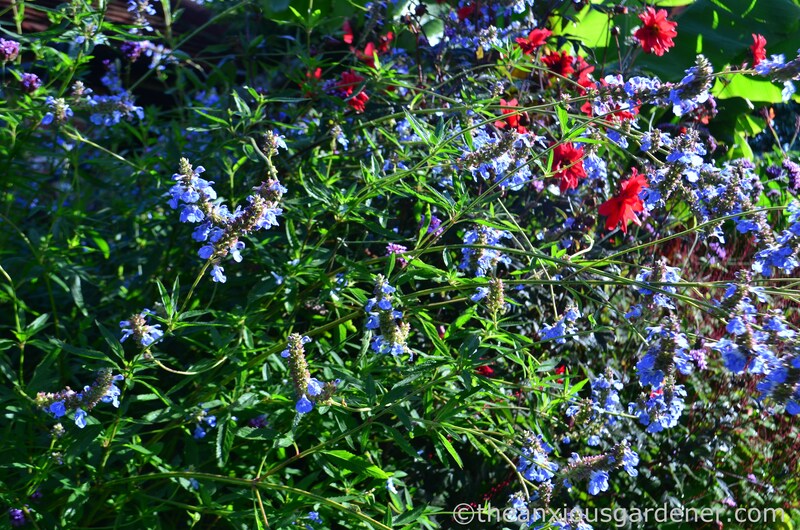 Because Salvia uliginosa isn’t reliably hardy for me, I normally lift and trundle it off to the cold frame. 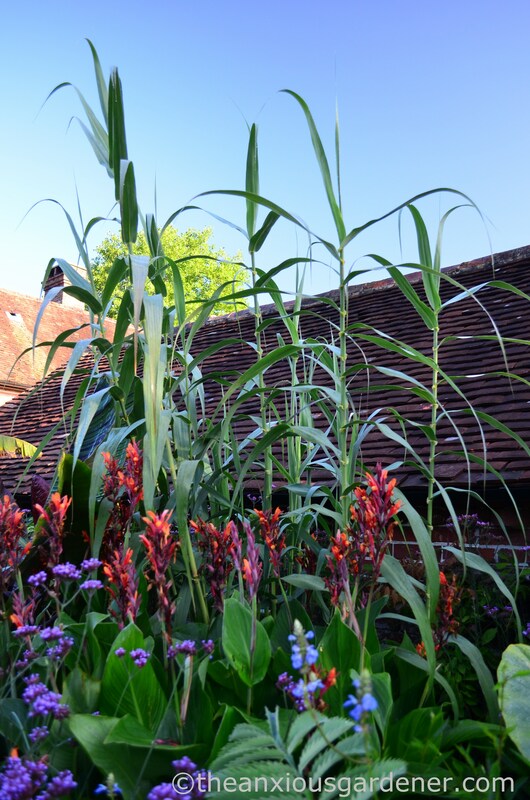 But I left them in situ last year – under thick leaf mould – and they sailed through our mild winter to become vastly bigger plants. So vastly big that I carted off loads to the bonfire. Which was a crime. Uliginosa is another favourite of mine but conditions here are too generous for it. 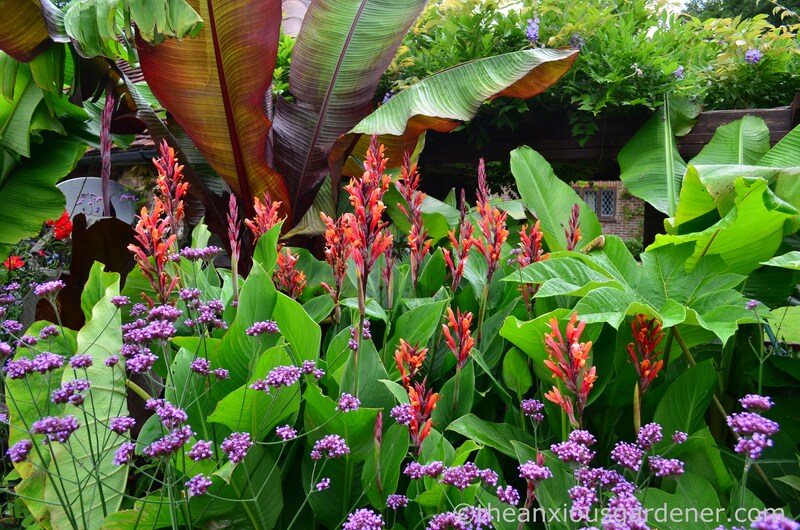 With plenty of chicken manure and regular watering it quickly shoots up to six-foot plus and then sags. 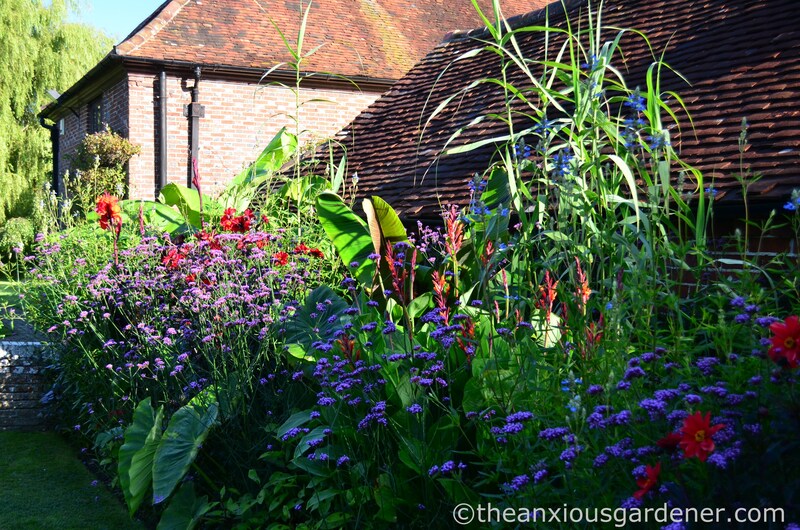 In other parts of the garden, where I treat it mean, it grows less tall but self-supports. 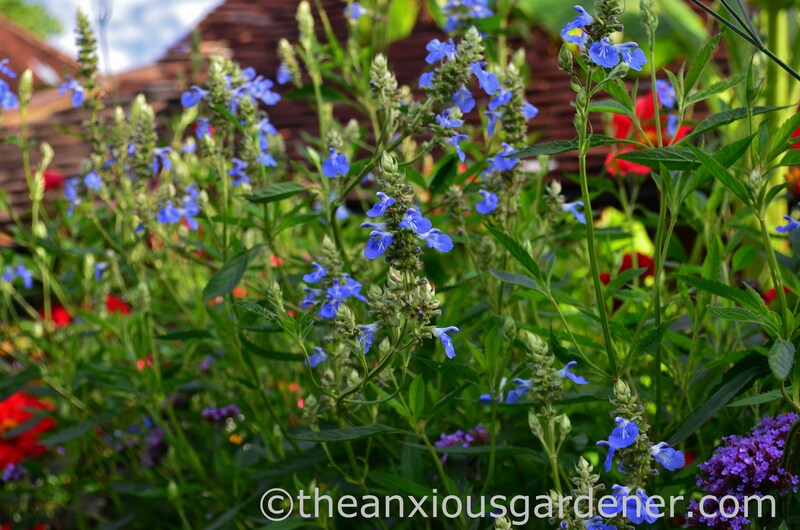 A fabulous plant – make a note. 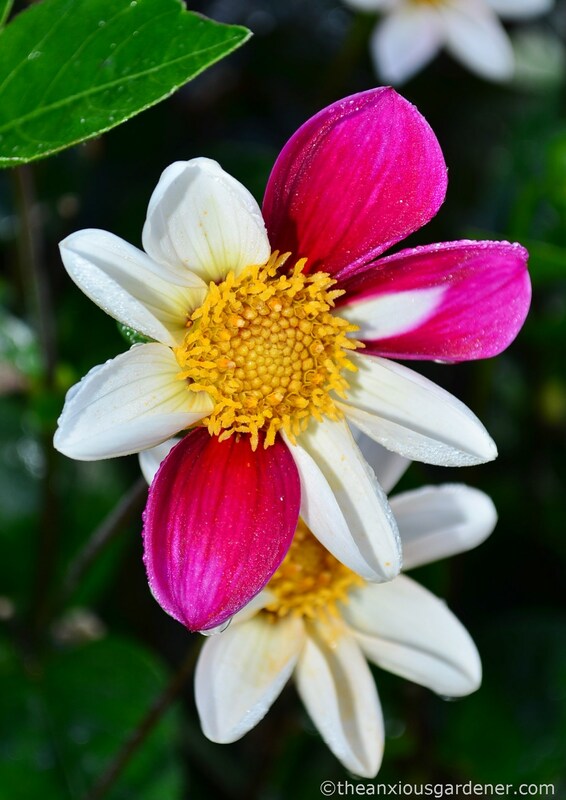 I use three dahlias: D. ‘Twyning’s Smartie’ is a non-stop flowering marvel. 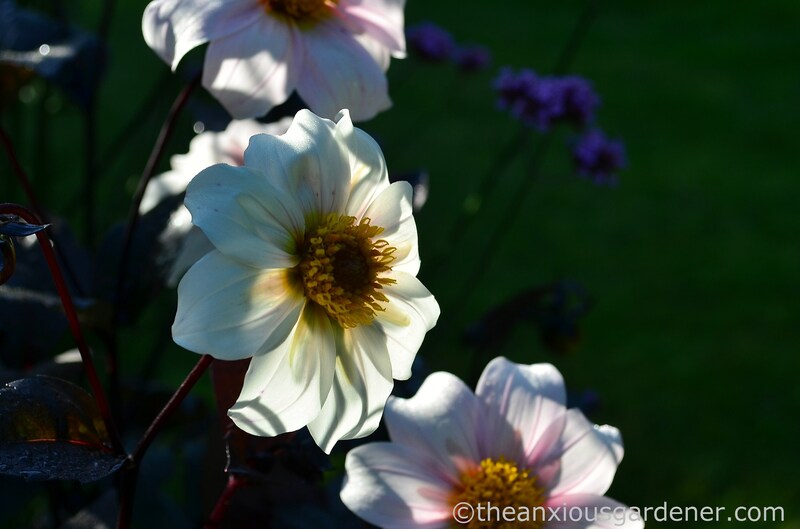 As is Dahlia ‘Twyning’s After Eight’ which I added last year. Dark foliage accentuates pretty white flowers with a golden centre. Another note maybe? And my third dahlia is the doughty D. ‘Bishop of Llandaff’. 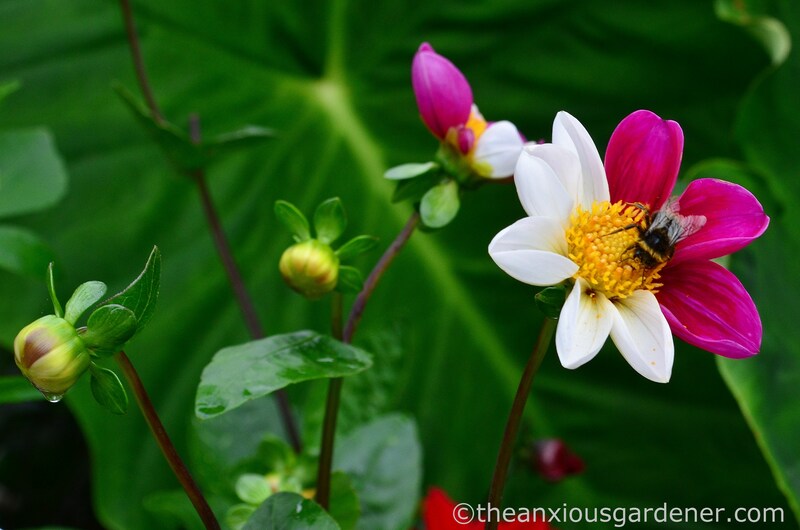 All of my dahlias are singles (for easy bee and butterfly access) and stay put year round. I don’t lift, dry and store the tubers. But they do need support. 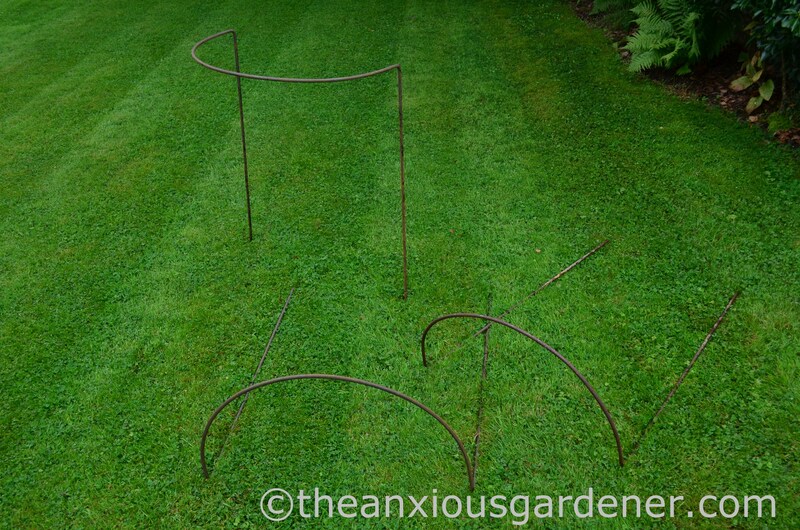 For which I use two dozen of these: 10mm diameter, 3 metre long steel bars bent into shape. They work well: either singly or as pairs forming a circle. 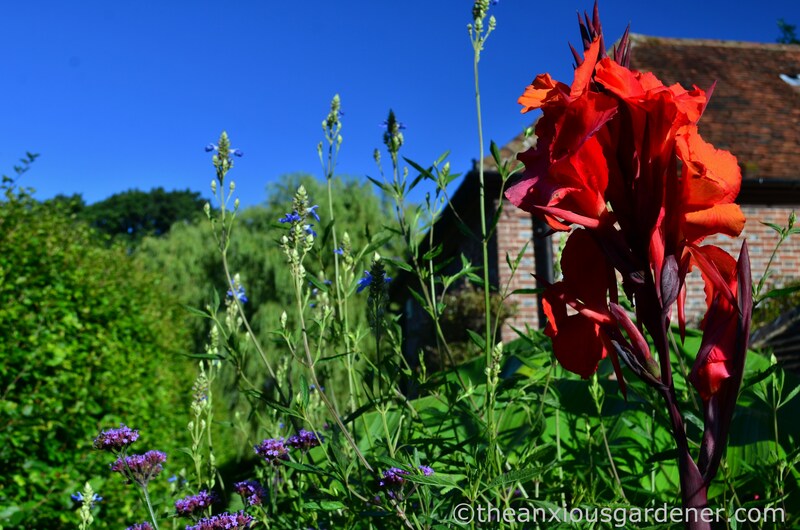 I’ve removed some plants altogether: spider daylilies because they took up too much space; Gaura lindheimeri removed itself by dying; Salvia patens I needed elsewhere; Fallopia japonica ‘Milkboy’ didn’t suit; and Lilium pardalinum fell victim to despicable lily beetle and their odious offspring. 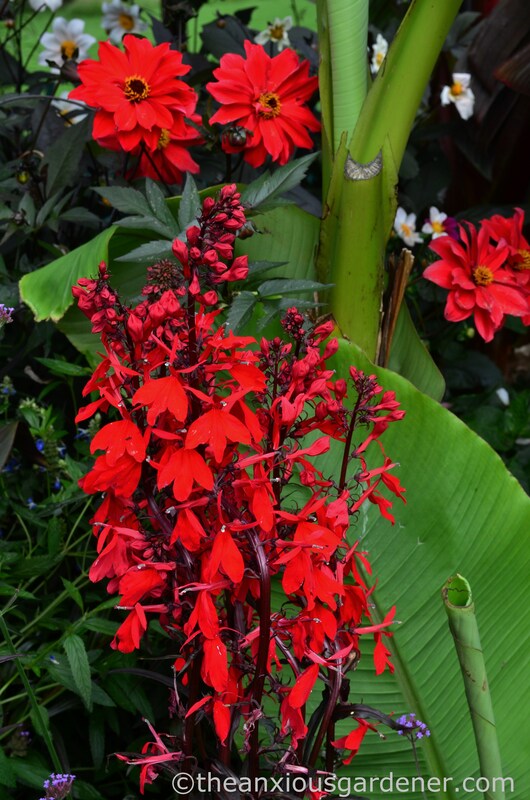 But above is a new addition to the front of the border – Lobelia cardinalis ‘Queen Victoria’. Hardly ‘tropical’ but it looks as if it should be. 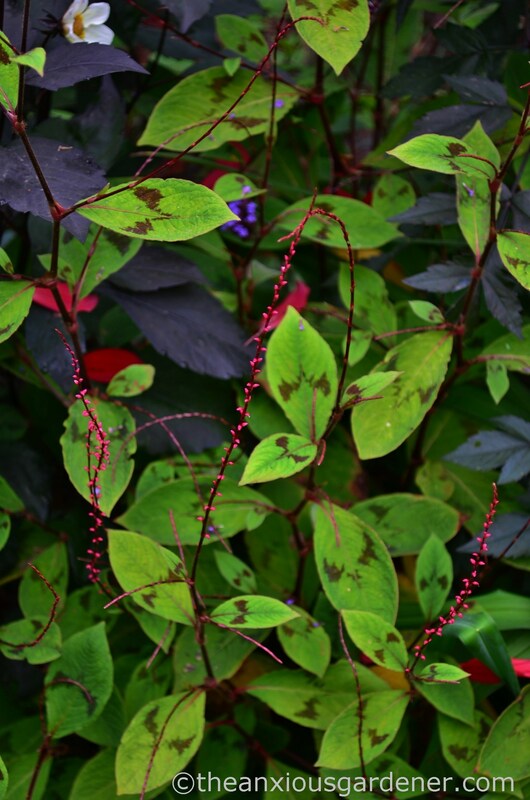 Also at the front are several Persicaria filiformis. I started off with one small plant (a rich gift from the boys at Alternative Eden) since when, as it gently self seeds, I’ve built up my stock. They now hide the ankles of taller bed-fellows. It does flower very late – just before the first frost. 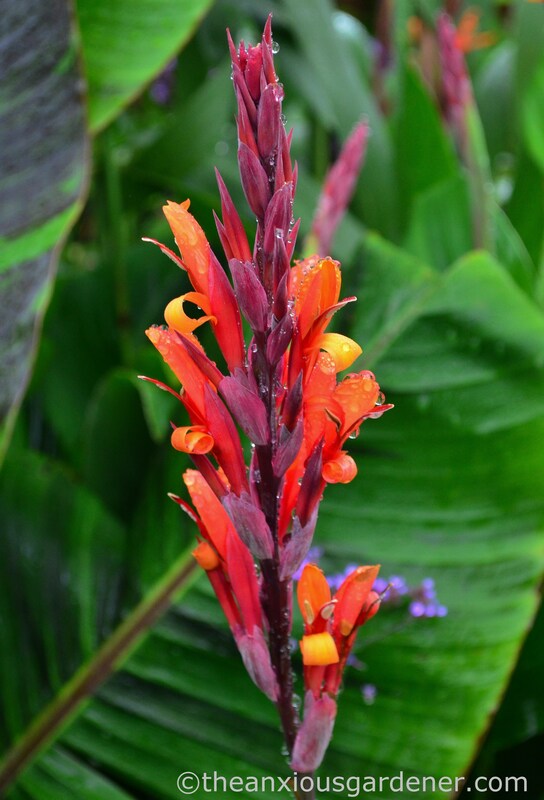 The flower spikes are subtle but more noticeable than this photo suggests. 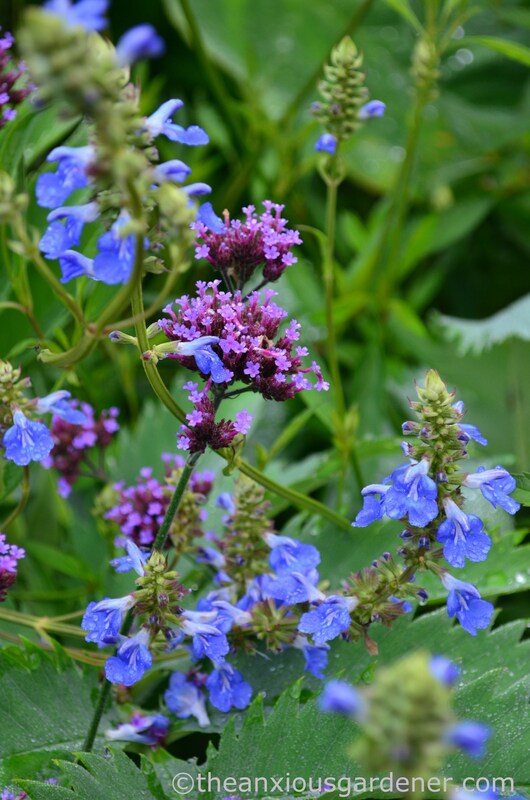 Apart from the late-flowering caveat it is useful, attractive, hardy and trouble-free. Note number 3? 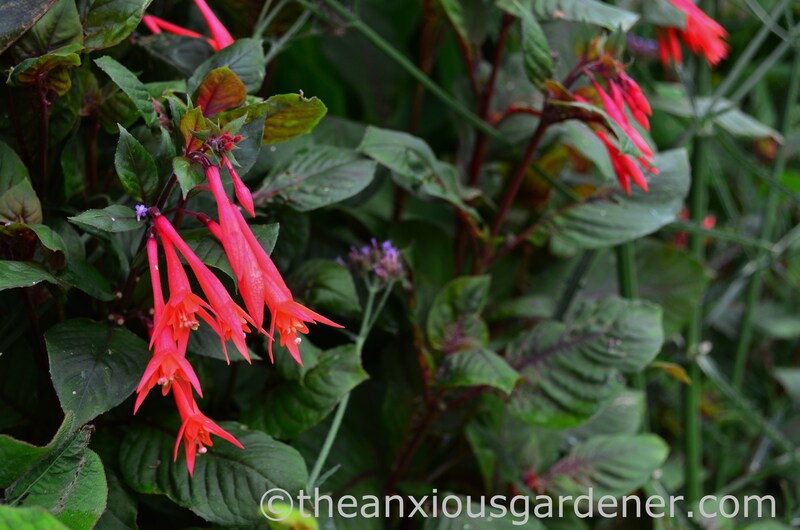 Knee-high at the fore is a sterling fuchsia, F. ‘Gartenmeister Bonstedt’ … but not frost hardy. I dig up mine and protect over winter. 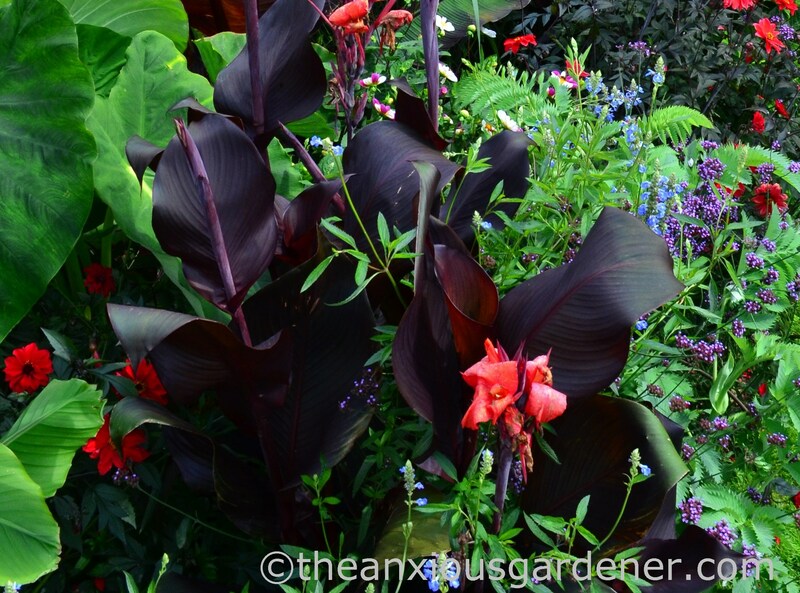 but actually I like the dark foliage more than the distinctly non-red flowers. I don’t lift these either. 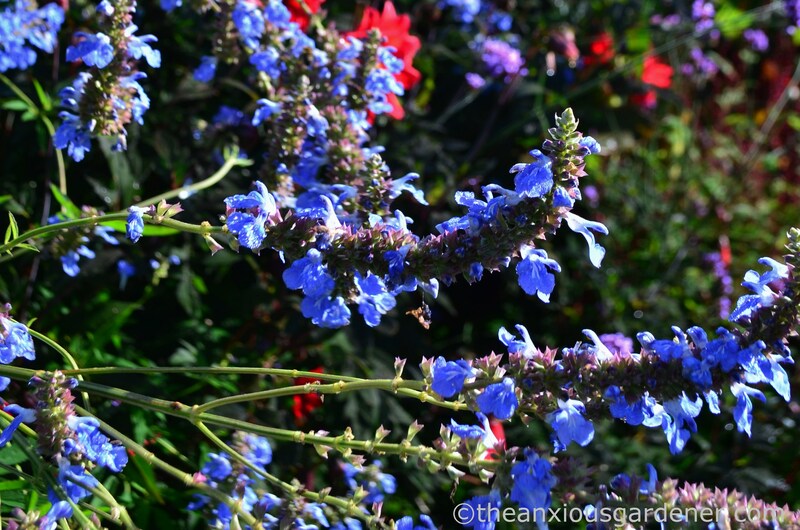 Dead-heading prolongs the show, it stays in the ground year round and it doesn’t need support. Win, win, win. I split my fast growing clump last year and now have two. Eventually I’ll have three. I will also split the Spanish reed (Arundo donax). It didn’t produce as many stems as I’d asked for but hey ho. 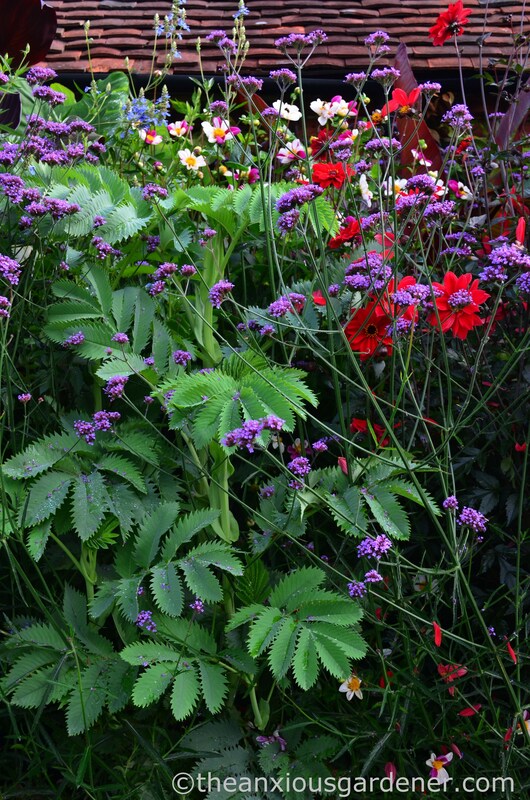 I haven’t been sparing enough with Verbena bonariensis. I added it as a filler when the border still had gaps but there is way too much. I’ll be ruthless next year – an almost imperceptible lattice would look far better, I think. So whilst year 4 has seen some setbacks, overall I’m quietly relieved. 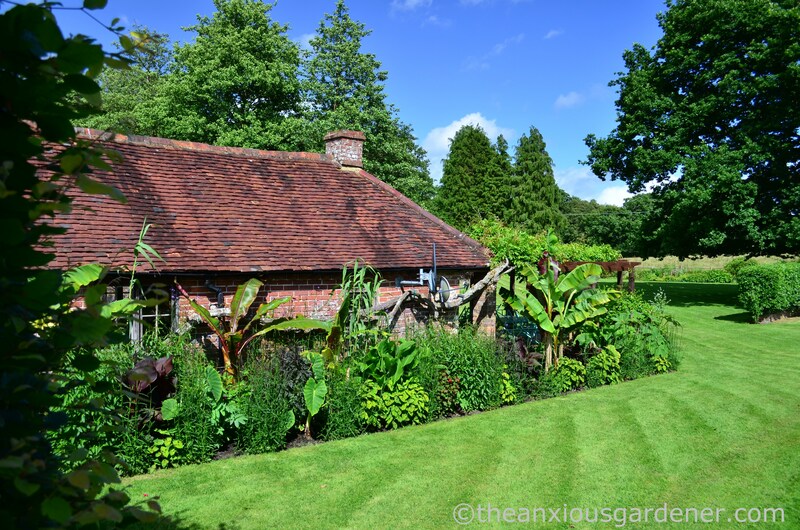 When I plan and plant up in the spring, it is difficult to know how a particular plant will perform: whether it’ll under-achieve and leave a gap; or burgeon and swamp the neighbours. 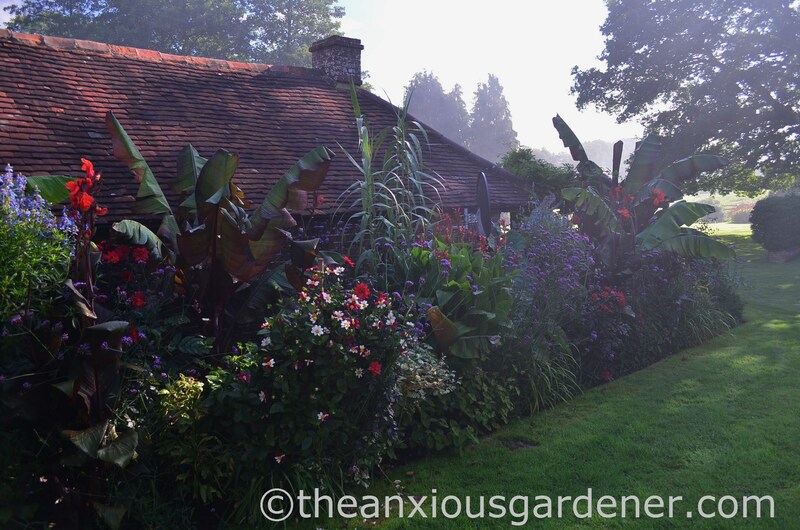 But I enjoy that uncertainty of the exotic border; its change from year to year; its continuing evolution and my ongoing experimentation; learning the foibles of the plants that call it home and meeting their various demands. 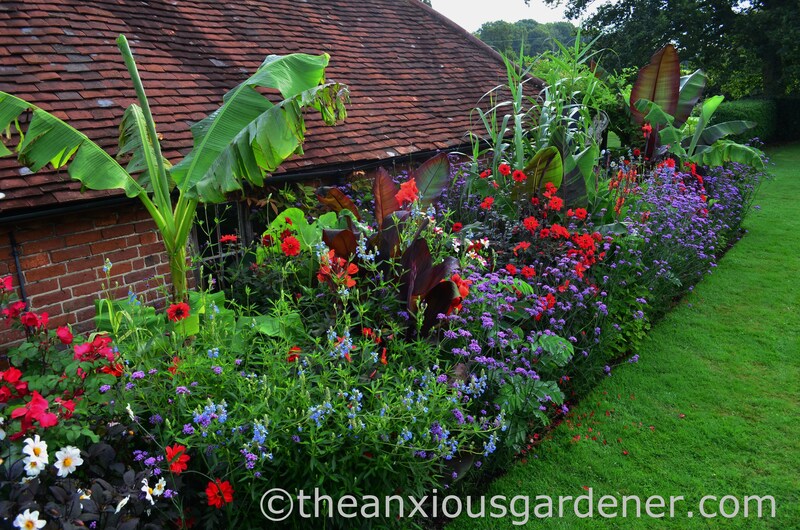 I fiddle, tweak and interfere; add new plants; divide, move and take out others … and wish for double the space. One day I hope to match the image in my head with the Priory reality. 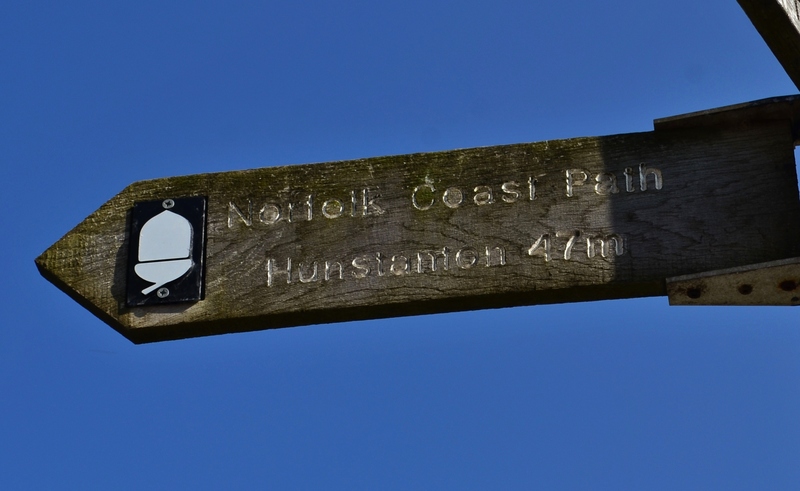 I’m almost there … but not quite.